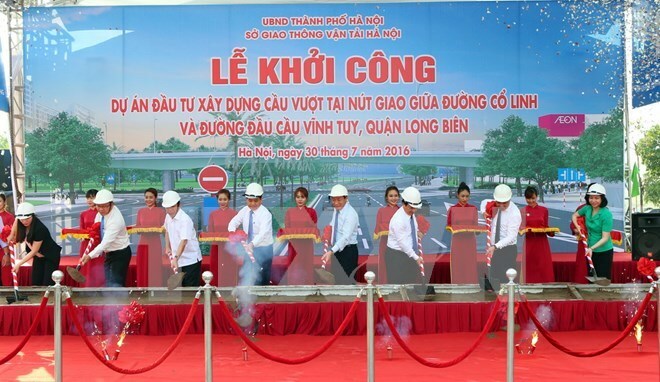 Hanoi (VNA) - The Hanoi municipal People’s Committee on July 30 held a ceremony to start the construction of a flyover bridge in Long Bien district. An overpass with a total length of 216 metres and a width of 12 metres will be built to connect Co Linh road and Vinh Tuy bridge. According to Vu Van Vien, Director of the municipal Transport Department, the overpass is needed because the area hosts dense population and high number of visitors to a cluster of recreational facilities there. The project is worth over 161 billion VND (7 million USD).